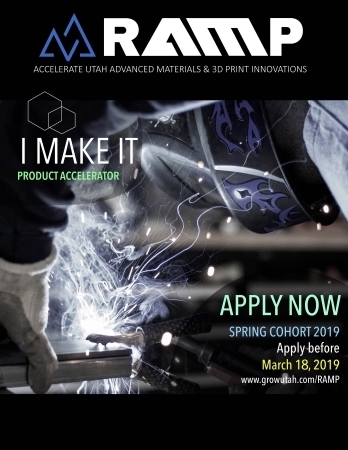 A product/startup accelerator for innovators utilizing carbon fiber, advanced composites or 3D printing as key components in their product innovations. 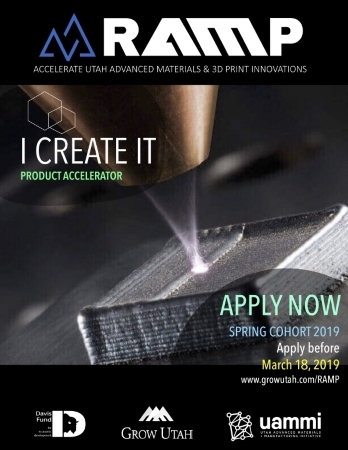 10-week intensive mentoring and training course immersing innovators in a highly engaged and interactive learning experience with business mentors, advanced materials experts and 3D print specialists. 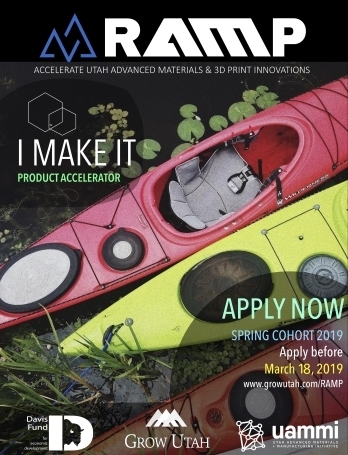 Companies receive financial support during the program and preferred consideration for follow-on funding from RAMP partners without giving up any equity. 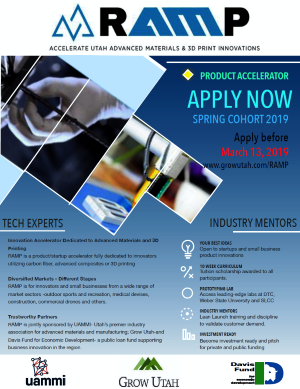 Rapid Launch RAMP is an 10-week intensive mentoring and training initiative immersing innovators in a highly engaged and interactive learning experience with business mentors, advanced materials experts and 3D print specialists who are each available to help achieve success. 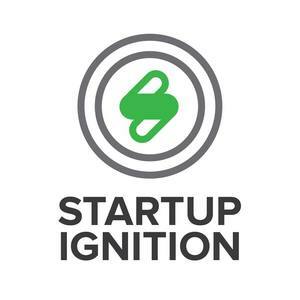 Lean Startup – On Line Training – Engaged Mentors – Learning Lab Innovators will be assisted in each stage of the lean startup process by joining weekly training sessions supplemented by individualized consultation with industry mentors. Privileged use of state of the art labs and technical equipment is a part of RAMP for product prototyping and materials testing. Diversified Markets – Different Stages RAMP invites innovators at different growth stages in their business as well as internal product teams. 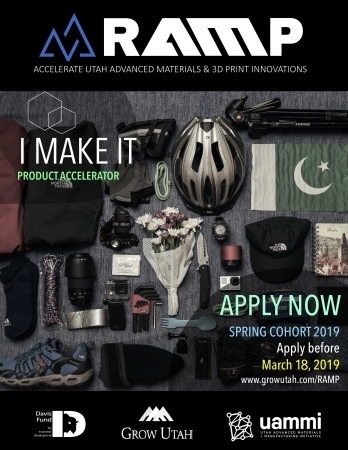 And it’s for innovators targeting a wide range of market sectors such as outdoor sports and recreation, medical devises, building construction, automotive, commercial aviation and more. 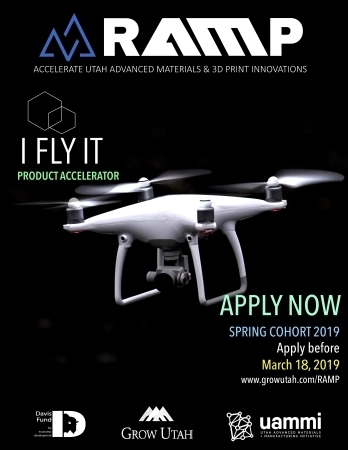 Tuition and Business Support Each RAMP participant receives a financial scholarship of $3k for the program tuition and preferred consideration for follow-on funding provided by our RAMP partners- all without requiring equity ownership in the business and at favorable terms. 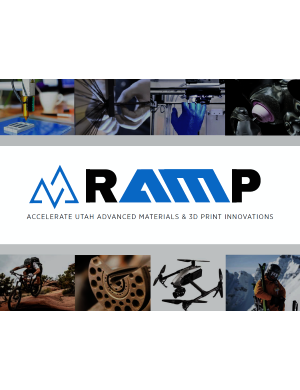 Northern Utah- The Center of Advanced Materials/ 3D Print Industry RAMP is hosted in Northern Utah- internationally recognized as the hub for carbon fiber and advanced materials manufacturing. 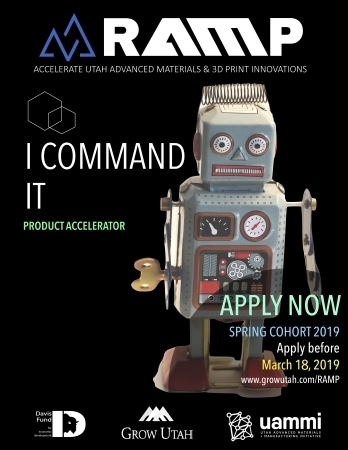 Providing easy access to the state’s industry cluster, each RAMP participant joins a community rich in innovators, technologists, product designers and business leaders. 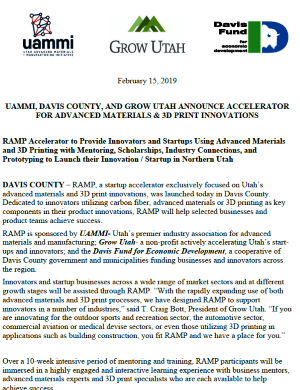 Trustworthy Partners RAMP is jointly sponsored by UAMMI– Utah’s premier industry association for advanced materials and manufacturing; Grow Utah– a non-profit actively accelerating Utah’s start-ups and innovators for over 25 years; and Davis Fund for Economic Development– a loan fund directed by a cooperative of Davis County government and municipalities supporting businesses and innovators across the region. PurTrek is the worlds first 2-in-1 trek pole with a built-in water filtration system allowing hikers to lighten their load and access instant hydration. IsoTruss technology combines the material advantages of composites with optimized geometry to create extremely light and strong structures. IsoTruss’ geometry allows it to support complicated bending, axial, and torsional loading scenarios by diffusing the load into unidirectional forces on each of it’s members. COMM is a communication device for climbing teams that does not rely on audio. It uses LED buttons and screen to deliver clear messages between partners while minimizing power consumption, bulk, and weight. Continuum aims to develop a continuous-loop manufacturing plant for composites and plastics, utilizing the world’s first recyclable thermoset epoxy system- Recyclamine. New products created with this resin can easily be recycled when their product life comes to an end. For example, a snowboard built with Recylamine resin can be broken down and the plastics reclaimed to create new products, such as sunglasses, goggles, or other items. 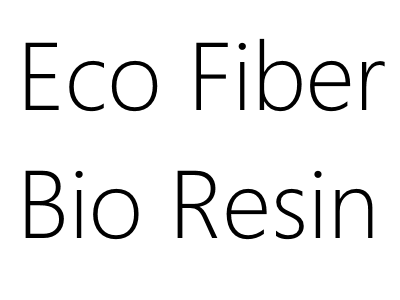 A bio-resin that uses eco-fibers (natural plant fibers) with synthetically produced formulations. These resins are more environmentally friendly and as well as commercially viable. Arctic Pack is a metal flask for keeping liquids cool or hot and is form-fitted to easily fit in backpacks. 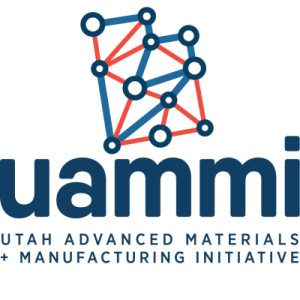 LR Dynamics is an aluminum foundry in Utah that will soon serve the aerospace, medical, and defense industries. They currently setting up prototyping services that pair with their existing foundry capabilities to offer prototype to production services for any customer. Dustless Tools manufactures industrial grade vacuums that integrate with sanders, grinders, and other tools and vacuum debris without spreading any dust. 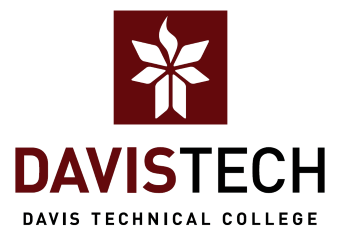 They are currently working to integrate 3D printing technologies into their manufacturing process. 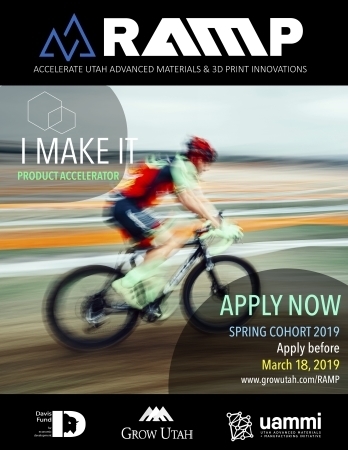 Parker Hannifen recently invested in an additive materials 3D printer housed in the company operating facilities in Ogden. This technology will be used for both internal product development as well as development for new markets with new uses.